It's the time of year where the make up sets/palettes are finally hitting the shelves in the drugstore in time for holiday shopping. Holiday shopping? It's only October! Well, it's never too early to shop (or to decorate) for Christmas in my opinion. One of my favorite drug stores is Walgreens. 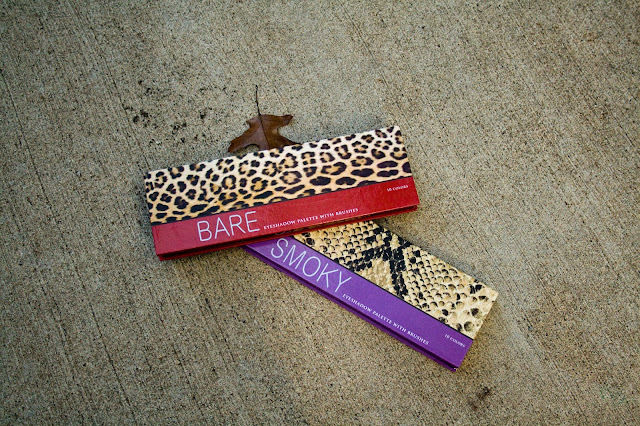 I was in there the other day & saw two Profusion eyeshadow palettes in Bare & Smokey for $5 each. 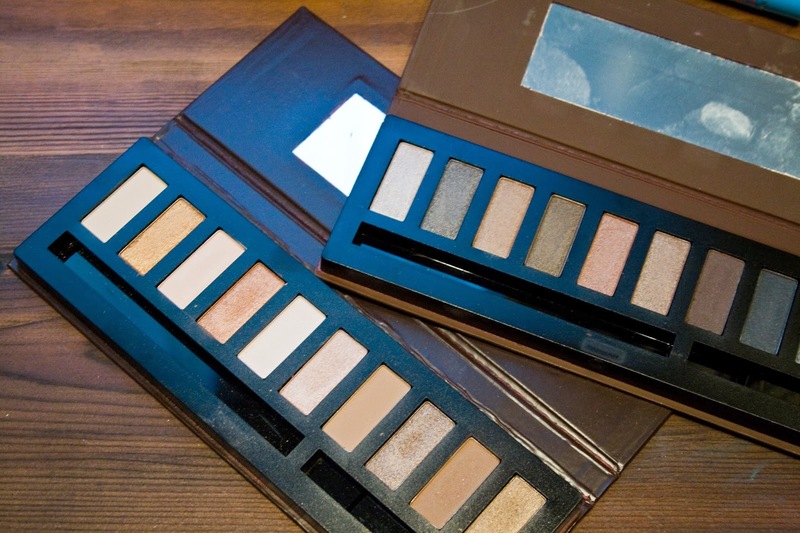 Now these palettes may look super familiar to you - the remind me of the Naked & Naked 2 palettes, though they aren't exact. I thought why the heck not & picked them up to add to my collection. Looking at them I didn't like the animal print, the purple & the red, and the font on the front. It just looked hokey to me! So I decided to see if I could spray paint them to make them more sleek & professional looking. It worked! 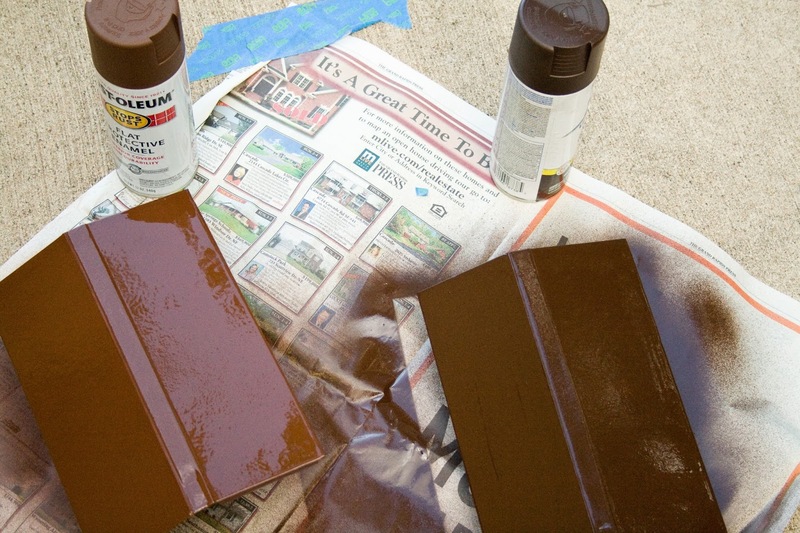 There are a bunch of palettes you could do this to, so if you have some hokey looking ones in your collection just make sure you tape off what you don't want sprayed. The good thing about these palettes that made it easy to paint was that the mirror was easy to tape off, there was already a plastic covering on the eyeshadows, & the eyeshadows were in a raised black plastic part - so you there wasn't much to tape off but the mirror. 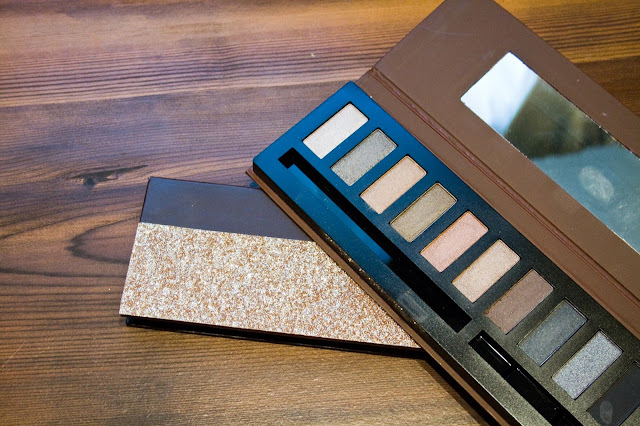 These would be quick, easy, customized gifts for a make up lover you know! Start by taping off what you don't want painted with painters tape. Lay out a sheet of newspaper or plastic big enough to cover your work surface. If you think it's big enough, you probably need more - spray paint travels! 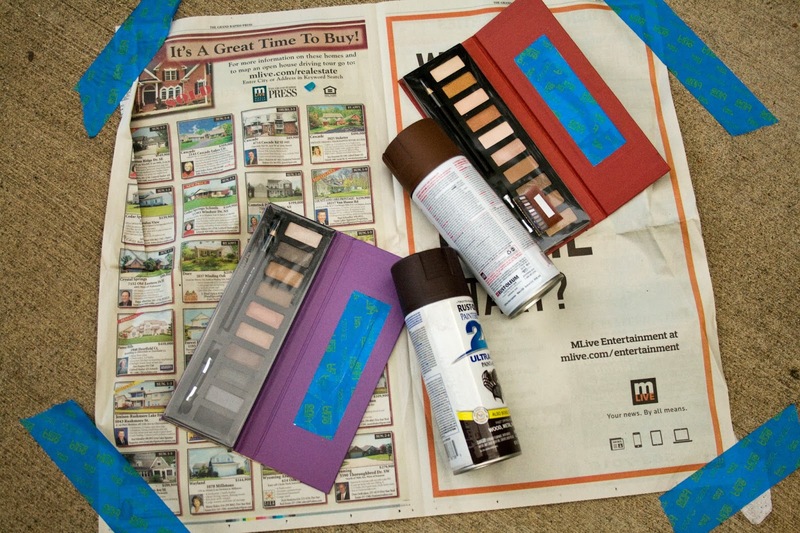 Prop up your palettes on something (I used other rolls of tape) & spray one side (I started with the back first). Let dry, then flip & spray the front. Let the palettes dry then carefully remove your tape. These palettes were super easy to paint because of the plastic covering on the shadows themselves. I added some glitter wall tape I picked up at Meijer (seriously, it was like $5 but you don't get a lot. How could I not buy glitter tape?) to the one I used most so I could remember which is which since they are both a deep brown color. I also glittered another one of my spray painted metal tins that I use as a freedom palette because I messed up the top. Glitter is the fix for anything, I think. I've also used these palettes a lot & the paint has held up pretty well which is rather exciting. Now I don't have two crappy looking palettes in my collection. 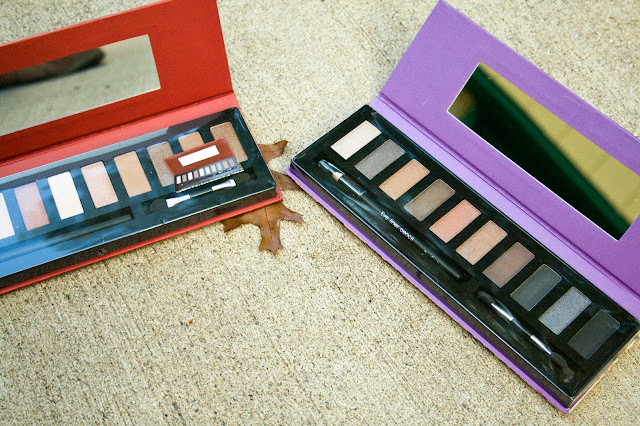 I'm sure you're dying to know if these $5 palettes are worth it - they are! I think they both have great quality & love using the Bare one (the one that now has glitter tape) for an everyday easy look.